Subscribe to receive a free eCookbook! Sign Up! 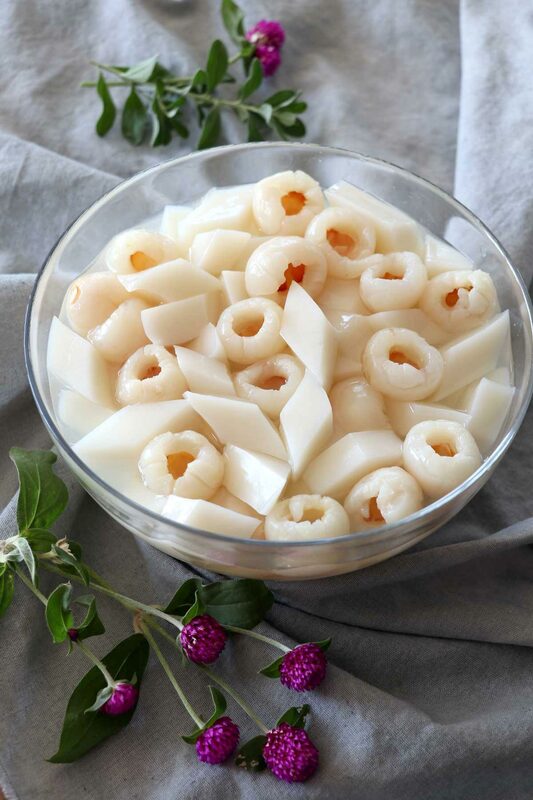 Light and refreshing, Almond Jelly is a classic Asian dessert of almond-flavored jelly that can be eaten on its own or usually paired with lychee or other fresh or canned fruits. This almond jelly with lychees is one of the easiest desserts I’ve ever made. It is also quite refreshing as it is served chilled. 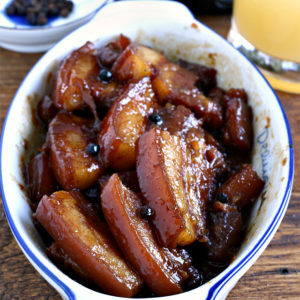 Perfect for regular day dessert but elegant enough for special occasions. With its subtle flavor and sweetness and overall being a light dessert, it is not surprising that one serving is never enough. 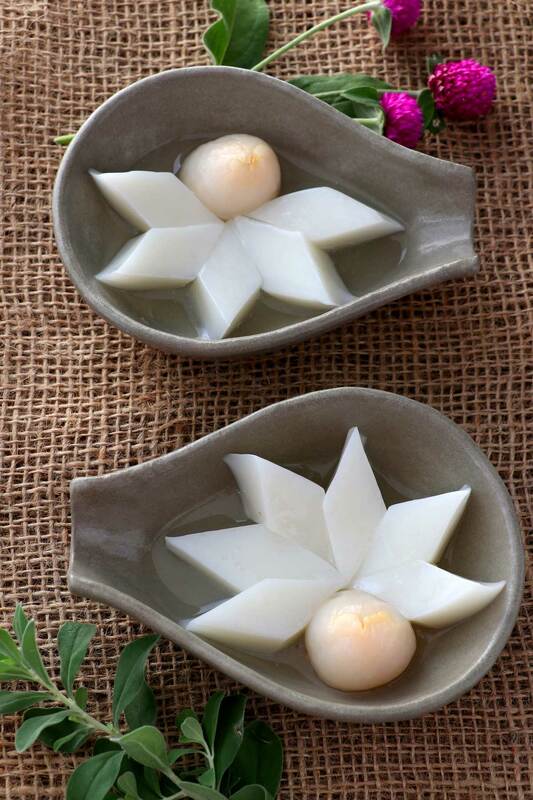 The original almond jelly or almond (Annin) tofu, as it is known in China where the said dessert hailed from, is really made from the apricot sweet kernel and not almonds. They look and smell alike and have the same Chinese translation, “Xingren” leading to the confusion in translation. Traditionally, apricot kernels are soaked in water, then ground to extract the ‘almond milk’. This liquid is then sweetened and mixed with a gelling agent, usually agar, and then heated. 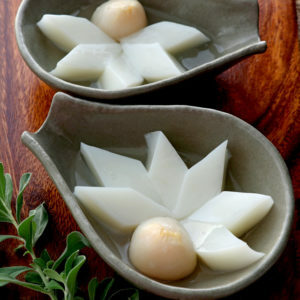 It is then chilled to let it set into soft tofu-like consistency. Nowadays, almond jelly is still a popular dessert, not only in China but in most Asian countries like Japan, Taiwan, Hong Kong and, of course, the Philippines. 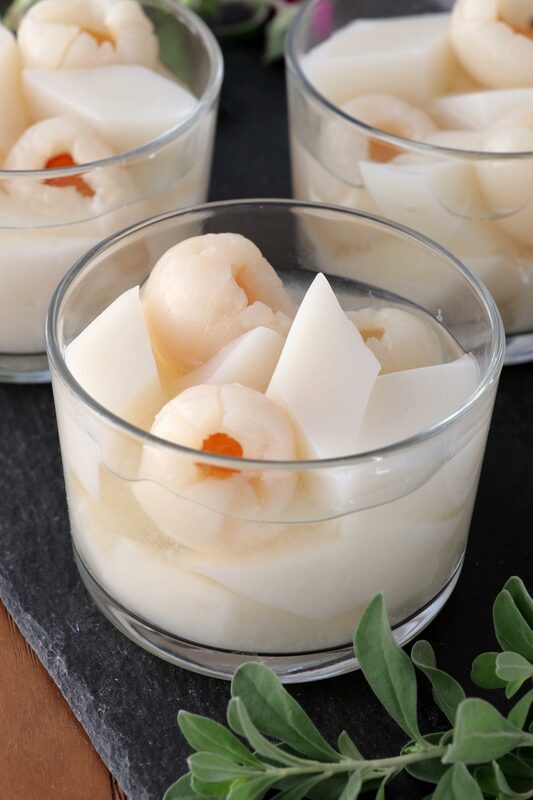 It is also much easier to make with as less as six (6) ingredients, that includes jelly powder, water, almond essence, sugar, milk and, in this case, canned Lychee, I am quite happy with this recipe. I’ve already mentioned the difference in using jelly powder and gelatin powder in my Coffee Jelly recipe, which you might also want to check out. 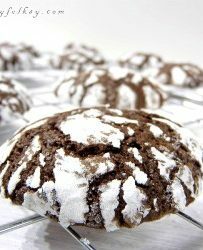 I’ve also used jelly powder in this recipe. WANT MORE RECIPES? Subscribe to our newsletter and follow us on Facebook, Pinterest and Instagram for all of the latest updates. 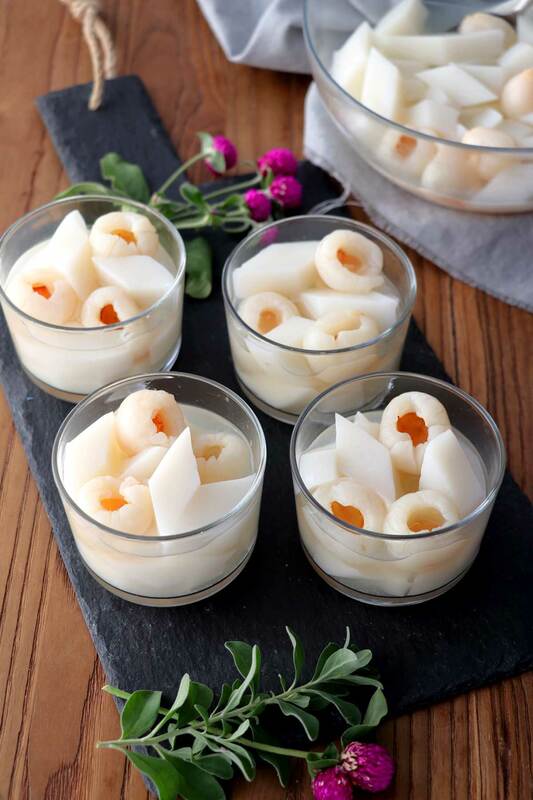 Light and refreshing, Almond Jelly, a classic dessert of almond-flavored jelly that can be eaten as is or paired with lychee or other fresh/canned fruits. 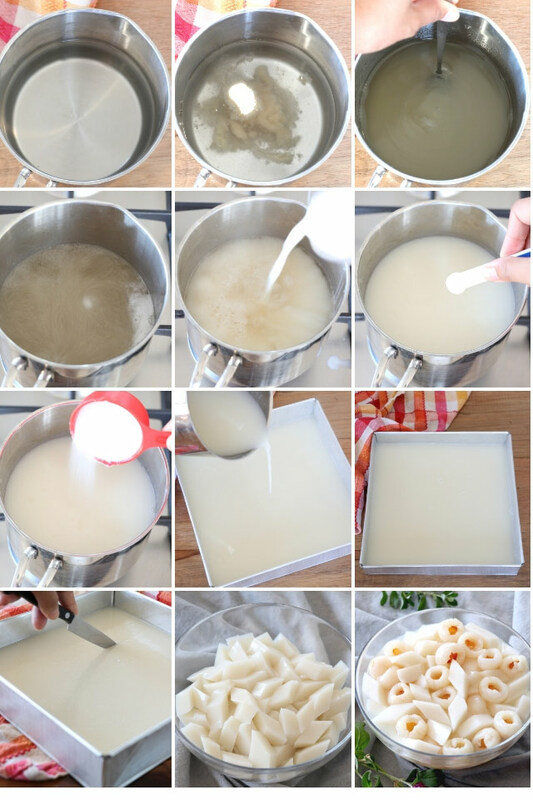 In a pot, add the water and gradually sprinkle jelly powder, stir until dissolved. Bring to a soft boil then remove from heat. Add milk, sugar, and almond extract and stir until completely dissolved. Pour mixture in a 9x9-inch square pan and let it cool to set. Using a knife, cut through the almond jelly horizontally and then diagonally to make diamond-shaped cubes. Transfer almond jelly to a large bowl or container with led. Add the lychees including the liquid syrup from the can. Cover and chill. Note 1. Gelatin powder can also be used and I would recommend using Knox but you may have to adjust the amount, 1 envelope =2 cups of water, so you will need 3 envelopes. The procedure is also different. You just dissolve the gelatin in hot water or hot coffee and refrigerate for 2 hours or until set. Tried this recipe? Tell us how it went. Tag us at @foxyfolksy or leave a comment and rating below. Bebs here! I love to cook and try new things and DIY projects! And although I think of myself as a homebody, I like seeing other places from time to time. If you are looking for a recipe and it ain't here, make a request and I will try my best to make it for you! 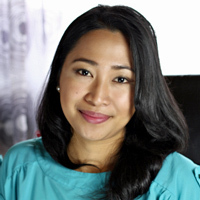 Hi Nicole, just checked out your amazingly beautiful site. So this nice comment coming from you means a lot to me. And I just downloaded your Prop-Talk Ebook, a new fan here! Hi! Welcome to Foxy Folksy, where I share my love of food, travels and DIY projects. Thanks for dropping by and I hope you enjoy your stay. 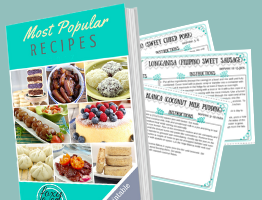 Plus get a FREE eCookbook + Printable Recipe Cards. Please check your email for a confirmation of your subscription. How to take care of orchids?